I don't know why it surprises me each and every time. I should just come to expect it by now. 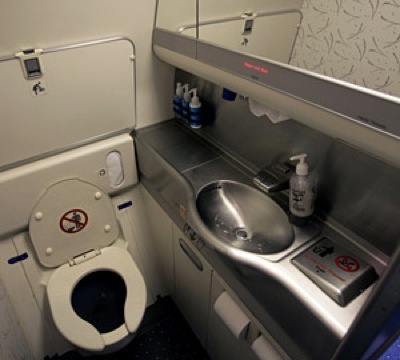 What I am talking about is how each and every time I go to the bathroom on an airplane something happens that does not help make the peeing process easy. Those rooms are so tiny and cramped that I can barely turn around in there and I am not an overly large person! I have had the bottom of my sweater or some piece of clothing go in that small toilet before and that is not pleasant! I now tie everything above my waist that is hanging down so it is secured. Why don't I just leave those layers on my seat? I get cold in there and who knows how long I will have to wait in that line because there is ALWAYS a huge line when I can't hold it any longer! The person in front of me always takes 10 minutes in there at least! I just get lucky that way! Then there is how the toilet bowl is shaped. Maybe it is the fact that I have to go so bad that it always seems that pee sprays back up between my legs. Yes, gross I know, but don't pretend something like that has never happened to you before!! I always want to hurry because of the line and I don't want people to wonder what I am doing in there after they see me tie all of my clothing up under my arms! I suppose I have to either slow it down or hold toilet paper in place to prevent a fountain! Turbulence is a given as soon as it is my turn to use the toilet on a plane as well. Every. Single. Time!! Seriously!! How can that be? That really doesn't not help my fountain situation either! I won't even get into the times that I take my kids in there with me because they have to go and want help or I am traveling with no other adults and I have to take them with me while I go! It is just a catastrophe waiting to happen and it rarely disappoints! I also refuse to change a diaper in there! I have simply layed the baby on my seat and change him or her right there if needed! There just isn't enough room! Moral of the story for me; skip the free beverage, wear less and tighter clothing, and go before I get on the plane at least 5 times even if I don't have to! Better Than My Plan! My Baby is Now 5! Partners in Crime! A Toddler and a Dog..
Now Back to Having a Room without a Baby in it!! How Could I Have Forgotten All Things Toddler??? Cakes and Pies! Cakes and Pies!! Why didn't any of you Mom's tell me!?!! The Roof! The Roof! The Roof was on Fire! !